The Raymon10 is one of our most popular products; it offers in one handheld system the functions and specification needed by people that work alongside radiation or need to identify gamma isotopes as part of their job. It is light enough to be easily carried; it can be used with gloves, it is built to survive being taken into the field and has everything built in to provide a portable detection and reporting solution. 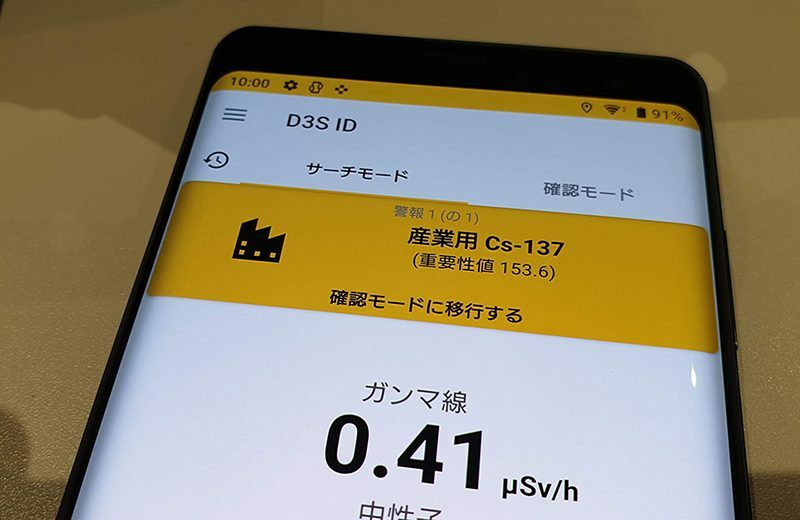 It is the tool for the radiation or CBRNE professional giving them in one lightweight handheld unit the analysis and recording capability they need, and now we are introducing the new Raymon10 handheld gamma spectrometer – keeping the same sensitivity but introducing some great new features. The new unit incorporates all user request and feedback from our distributors. The main change is the new tablet unit, running Windows 10, which has a higher resolution, brighter and larger touchscreen. The CZT GR1 detector in the probe and the functionality of the unit remain the same. If you are used to the old model, you will be able to pick up the new model and use it straight away. We have made it much easier and quicker to use so you will notice a huge difference in usability. The probe remains the same with a GR1 CZT gamma detector offering 10mm x 10mm x 10mm CZT coplanar-grid detector, energy range: 30keV to 3.0 MeV, energy resolution: 2.0 – 2.5% FWHM @ 662 keV. The Raymon10 features redesigned gamma spectrometer software that makes great use of the larger screen; it is faster, easier to navigate and simpler to use compared to the old model. 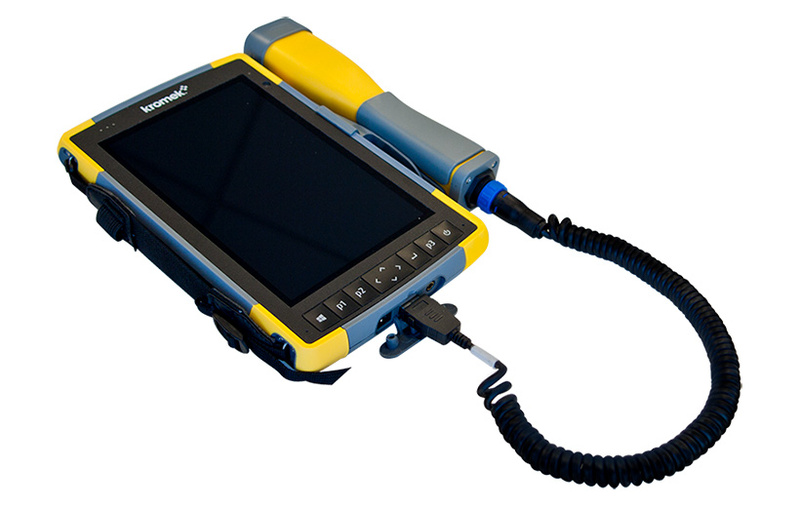 Very rugged tablet: built to take a knock – IP68 waterproof and dustproof, operating temperature: -20 C to 50 C (-4 F to 122 F), shockproof (multiple drops from 4′ (1.2 –1.5 m) onto concrete) and designed for MIL-STD-810G test procedures. Much better screen: with a large active, bright viewing area – 178 mm (7-inches), resolution: WXGA (1280 x 800). High-visibility backlit LCD for best-in-class sunlight view-ability. Portrait or landscape orientation with automatic screen rotation. Improved touch capability: a projected capacitive multi-touch interface for use with gloves, small tip stylus, and in wet conditions and optically bonded for increased visibility and strength. Chemically-strengthened Dragontrail High Ion-Exchange (HIE) cover glass for excellent impact and scratch resistance. New hand strap: the pistol grip has gone and been replaced by a strap that holds the unit firmly against your hand. The strap makes it much harder to drop the tablet and makes the Raymon10 less tiring to hold. The unit lies flat: with the pistol grip gone the unit lies flat in the table making it much easier to use once back at a desk. An inbuilt camera as standard: front-facing 2 MP and rear-facing 8 MP with LED illumination. Embed photo with date, time, and GNSS position. Better battery: removable Li-Ion battery, 43.2 Whr. Operates 8–10 hours on one charge. It is optimised for reliable performance in cold temperatures with excellent lifecycle performance. Smaller rugged case: the new unit fits into a much smaller and lighter rugged case. Unlike the old unit, the new Raymon10 fits in the case assembled, so it is ready to use immediately. The functionality of the software remains the same; if you have used the old unit you will be able to pick up the new one and use it straight away. What you will notice is that the larger screen makes it much easier to see the readouts. We have also made some changes to the menu structure to make it quicker to get to the most used functions. The more powerful tablet means that the software will feel quicker and more responsive when you use it. Find out more on our Raymon10 product page.